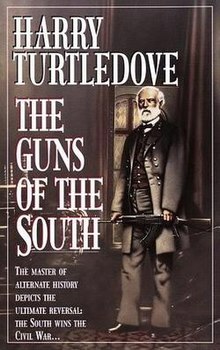 The Guns of the South is an alternate history novel set during the American Civil War by Harry Turtledove. It was released in the United States on September 22, 1992. The story deals with a group of time-travelling white supremacist members of the Afrikaner Weerstandsbeweging (AWB) from an imagined 21st-century South Africa, who attempt to supply Robert E. Lee's Army of Northern Virginia with AK-47s and small amounts of other supplies (including nitroglycerine tablets for treating Lee's heart condition). Their intervention and technologies results in a Confederate victory in the war. Afterwards, however, the AWB members discover that their ideas for the Confederate States and Lee's are not one and the same as they believed and the general and the men of the South have a violent falling out with the white supremacists from the future. In January 1864, the Confederate States is on the verge of losing the Civil War against the United States. Men with strange accents and oddly-mottled clothing approach Confederate General Robert E. Lee at the headquarters of the Army of Northern Virginia. They demonstrate a rifle far superior to all other firearms of the time. The men call their organization "America Will Break" (or "AWB"). They offer to supply the Confederate Army with the rifles, which they refer to as AK-47s. The weapons operate on chemical and engineering principles that are unknown to Confederate military engineers. The AWB establish a base in the little town of Rivington, North Carolina, making it into a combined fortress and arsenal. They also set up offices near the War Department, in the Confederate capital of Richmond, Virginia. The AWB continues to offer inexplicable intelligence and technology to the Confederacy, providing Lee with what they call nitroglycerin pills, which ease his frequent chest pains. Finally, Lee questions their leader, Andries Rhoodie, who provides Lee a partially true explanation. The men of AWB are Afrikaner Neo-Nazi ultra-nationalists from a post-apartheid South Africa, having traveled back in time from 2014, 150 years into the future after the end of the Civil War. The newcomers claim that white supremacy has not endured to the modern era and that blacks have marginalized whites. Lee is told that President Abraham Lincoln will act as a vicious tyrant during his second term and that his successor, Thaddeus Stevens, will continue his work to ensure that blacks will become the dominant political faction in the former Confederacy, as they outnumber whites in many areas. The AWB says that blacks will take over other countries, including the United Kingdom. The AWB men train soldiers to use their new weapons and issue ammunition. As the men see the power of the new weapons, the Confederate morale improves considerably during preparations for the 1864 campaign against Union forces. With the AWB's guns and some direct military aid from the time-traveling Afrikaner South Africans, the Army of Northern Virginia drives Union General Ulysses S. Grant's forces out of Virginia. In a surprise night attack they capture Washington City, thus ending the Civil War. To the amazement of most of the Confederate troops, Lincoln refused to flee the capital during their advance and appears on the White House lawn. He addresses them before personally surrendering to Lee. The United Kingdom and France recognize the Confederacy, and Lincoln is forced to accept the Confederate victory. As Confederate forces begin to end their occupation of Washington, and Union troops withdraw from the portions of the Confederacy that they had captured earlier in the war, the new country starts to determine its future social and political direction. In negotiations between the two countries, to which Lee is made a Confederate representative, the Union reluctantly agrees to pay millions of dollars in war reparations. The Confederacy, in turn, gives up any claim to Maryland and West Virginia. After much debate, both sides agree for Kentucky and Missouri to hold elections to determine whether they will remain in the Union or secede and join the Confederacy. The two countries appoint Lee and his former opponent, Grant, to supervise the elections to ensure fairness. At one point, AWB men are caught smuggling weapons into Tompkinsville, Kentucky. When questioned, they disclaim any effort to affect the outcome of the elections. They claim to be selling weapons, which is highly unlikely because of the group's overwhelming wealth. Other supporters, both official and unofficial (including Lincoln, a Kentucky native), pour into both states to try to sway voters. Despite an assassination attempt on Lee by a former slave in Louisville and the machinations of Rivington men, the election goes as planned, with Kentucky voting to join the Confederacy and Missouri voting to remain in the Union. In the 1864 United States presidential election, it takes until November 19 to work out whether Democrats or Republicans had won the election. The Democrats' candidate, Horatio Seymour, and his running mate, Clement Vallandigham, narrowly defeat Republican US President Abraham Lincoln and Vice President Hannibal Hamlin. Seymour and Vallandigham win 41.5% of the popular vote and get 1,671,580 votes. The ticket also carries 138 electoral votes from ten states (New York, Pennsylvania, Ohio, Indiana, Missouri, Wisconsin, Maryland, Oregon, and California). Lincoln and Hamlin come in second in both the popular and electoral votes. The ticket gets 40.6% of the popular vote and gets 1,638,415 votes and wins 83 electoral votes from twelve states (Maine, New Hampshire, Vermont, Massachusetts, Rhode Island, Connecticut, Michigan, West Virginia, Illinois, Minnesota, Iowa, and Nevada). After George McClellan failed to gain the Democratic nomination, he runs as an Independent candidate with former 1860 Constitutional Union Party Vice Presidential nominee Edward Everett, as his running mate. That ticket comes in last in the popular votes but third in the electoral votes. The ticket gets 7.1% of the popular vote with 287,749 votes and gets 10 electoral votes from the states of Delaware and New Jersey. Coming in third place in the popular vote and last in the electoral, Radical Republican candidate John C. Fremont (who was the Republicans first nominee, in 1856) and his running mate Andrew Johnson, get 10.8% of the popular vote with 436,337 votes and carry only 3 electoral votes, from Kansas. Out of more than 4,000,000 votes cast, Seymour beats Lincoln by just 33,000 votes. Confederate slaves freed during the war by the US violently resist returning to slavery; many who made up US military units during the war continue to fight Confederate forces long after the Union formally surrenders. That frightens many Confederate whites and infuriates the troops charged with fighting them, particularly Nathan Bedford Forrest and his men. Lee, already dubious about slavery and respectful of the courage of the United States Colored Troops during the war, becomes convinced that continuing to enslave blacks is both morally wrong and ultimately impracticable. He believes that it is impossible to try to return to prewar conditions. He thinks that black guerrillas will continue to raid and perhaps prompt a general slave rebellion in the near future. The parts of the Confederacy that had fallen to the US during the war had already lost many of their slaves, who were freed as soon as the US troops had arrived and did not return to their previous masters. In other parts of the Confederacy, many slaves had run away, mostly to US lines, where they gained their freedom. Despite threats from Rhoodie and the AWB, Lee makes no effort to hide his views. At the urging and with the full backing of Jefferson Davis, who may not be reelected under the Confederate Constitution after his six-year term, Lee runs for President in the 1867 Confederate States presidential election, despite Davis's initial reservations about Lee's views on slavery. The Rivington men convince Forrest to run against Lee's pro-abolition, anti-slavery Confederate Party, on a pro-slavery Patriot Party ticket with Louis Wigfall as his running mate, and they put their considerable resources into Forrest's campaign; their offices in Richmond serve as his campaign headquarters. They draw from their large supply of gold coins (in the form of Krugerrands). Lee achieves a narrow victory after he wins Tennessee's electoral votes. Lee wins the national election 69-50 in the Electoral College and by 32,000 popular votes out of 963,437 cast. He carries the Confederate states of Florida, Georgia, the newly-admitted Kentucky, North Carolina, Tennessee, and Virginia. Forrest wins the Confederate states of Alabama, Arkansas, Louisiana, Mississippi, South Carolina, and Texas. Following his loss, Forrest concedes defeat and pays a call to Lee at Arlington, promising to help rally the young nation behind its new president. Soon after the election, Lee receives a history book that was stolen from the Rivington men from a former Confederate soldier, which covers the Civil War and the original outcome that was supposed to happen without the AWB's intervention. Enraged at the lies that Rhoodie had told him about the future, Lee confronts the AWB leader by using the modern history book as proof of Rhoodie's dishonesty. Lee compares his fanaticism to that of John Brown. Faced with the accusations, Rhoodie promises to show the AWB's true colors to Lee. At Lee's inauguration on March 4, 1868, AWB men try to assassinate him by using Uzis, which results in the death of Lee's wife, Mary; his vice president, Albert Gallatin Brown, various dignitaries and generals, and many civilians. Police forces seize the AWB offices in Richmond after a fierce battle. Lee enters the stronghold to find more technological marvels (such as fluorescent light bulbs and air conditioning), books that document the increasing marginalization of racism from 1865 into the 21st century, and the efforts made to improve relations between blacks and whites. Lee shows the books to Confederate Representatives in the hope that the future's nearly-universal condemnation of slavery and racism will convince them to vote for his plan for gradual abolition. Appalled at the AWB attempted assassination Forrest offers his services to Lee without reservation and is put in command of the hastily-remobilized Confederate forces. They ready to do battle with the AWB men, and Lee declares martial law in the Rivington area. Confederate forces lay siege to Rivington and engage the AWB, which uses modern weaponry such as belt-fed machine guns, sniper rifles, mortars, barbed wire, and land mines to inflict heavy casualties on the Confederate forces. During the campaign, Henry Pleasants, an American soldier who was captured by Confederate forces late in the war and decided to remain in the Confederacy, where his skilled labor would be more in demand, conceives a similar scheme, as he did in the real-life Battle of the Crater. It is quickly accepted by commanding General Forrest, and President Lee orders for Pleasants's name be kept a secret to avoid tipping off the Rivington men aware of Pleasants's real history. Unlike in the real battle, the infantry successfully capitalize on the opportunity. Despite suffering heavy casualties because of the vast technology gap, Confederate infantry destroy the AWB's time machine during the fighting and seize the town after they break through the AWB defenses. The few surviving AWB who were unable to escape back to their own time lose hope and surrender. Soon after being captured, Rhoodie is killed by an enraged slave. Well aware of the Rivington men's cruelty and treason, the Confederates spare the slave from any harm. In Richmond, the Confederate Congress narrowly passes President Lee's gradual emancipation bill. Pharmacists have copied the nitroglycerin pills brought by the AWB, and Lee hopes, with their help, to live to see the effects of his plan for emancipation. Meanwhile, a few of the stranded Afrikaner South Africans agree to help the Confederacy replicate their 21st-century technology from 2014 so that Lee can counter the Union in both its replica AK-47s and its greater industrial strength. Though the Confederacy has maintained strict neutrality in a war that the Union had started with the British Empire by invading Canada, Lee fears that the Union may later attempt a war of revenge against the Confederacy. He rests assured that the Confederacy will, however, remain the most technologically advanced country in the world for many decades to come. The book won the John Esten Cooke Award for Southern Fiction in 1993. A Rebel in Time, another Civil War alternate history involving time travel and a racist sending advanced weapons to the Confederacy. "Still Valley", a The Twilight Zone episode focusing on the Civil War. Southern Victory, another Turtledove novel focused on a Confederate victory and its circumstances.